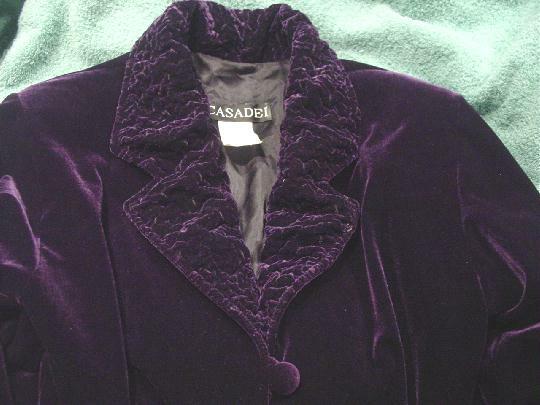 This purple-eggplant velvet evening jacket has a modified waiter's styling and was made in the USA by Casadei. It's 90% polyester and 10% spandex and has a black full lining. There are long sleeves, shoulder pads, and it has a three fabric covered button and loop closure down the front. The collar and lapels have a high-low elevated design. The front tips are 2 1/4" longer than the back and 4" longer than the side seams. The tag says S, but it fits more like a size 4.
shoulder to bottom front tips 21"
shoulder to bottom side seam hem 17"
bottom hem side to side 15"